A bifurcated fiber assembly is the most common example of a fiber optic bundle and is used to either split a signal or combine signals. 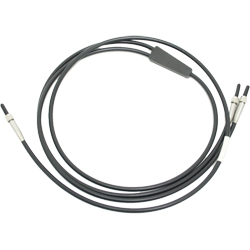 The BFA series combines optical fibers at a common end with the fiber optic bundle bifurcated into two separate channels, terminated with standard SMA 905 connectors. Assemblies are available with UV or NIR grade fused silica optical fibers with fiber core diameters of either 200µm or 400µm. The BRS is a customized bifurcated fiber optic assembly featuring broadband-grade fiber optics at the common end with three fibers evenly distributed around a center fiber. The bifurcated ends have a single optical fiber in one terminal and three fibers in a linear format in the other terminal which align to a spectrometer entrance slit. BRS fiber assemblies are offered for OEM customers only. Some of the most common applications for bifurcated fiber optic bundles are those that require you to direct light from a sample into two different spectrometers. This is generally used to extend the spectral coverage of the measurement, either to maintain higher resolution, or to cover an extended range. Conversely, a bifurcated fiber assembly can be used to direct light into a spectrometer and measure the light reflected off of the sample.